RED FLAG moment. Okay, the first thing that comes to mind is if she is a spokesperson, do you think she is getting paid? Probably . . . You think there might be a little bias? I will let you answer that on your own. I am still a little confused by this phrase. Corn is not used as a pesticide, but rather, is a grain used for livestock feed, ethanol and human food. It seems to me she is misconstruing the facts and is probably referring to BT (bacillus thuringiensis) corn. I will try to keep this explanation about BT corn as simple as possible–BT is a natural bacteria commonly found in soils and is NOT toxic to humans. In fact, I probably have breathed in BT numerous times just by standing outside of my house because we have soil nearby. BT produces a protein that when ingested by certain larva-type insects (such as corn borer, which is very destructive to corn plants) causes death in those insects. BT targets specific insects, not all insects. In fact, organic famers can use BT as a pesticide for their organic crops. Injected BT is also used in some organic plants. BT corn is genetically engineered by isolating a specific gene that produces the protein (the protein that causes death in insects) and that one gene is placed into the corn plant. This results in a GMO (genetically modified organism)–One gene out of tens of thousands of genes. 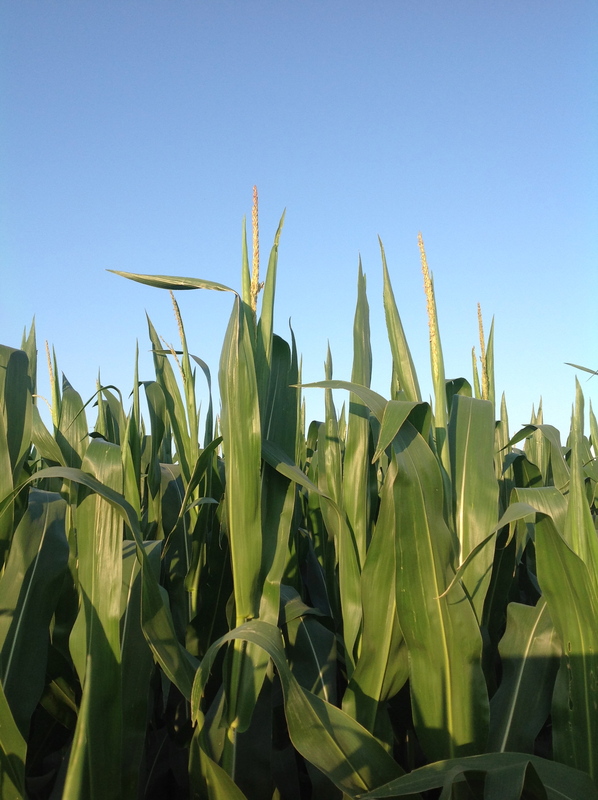 When the insects start to eat the corn plant, they will ingest the BT protein and die. Only at the time the protein is in the gut of a larva is it considered a pesticide. It has absolutely no effect on humans. In addition, Bt has helped drop organophosphates (which are very bad) by 50%. This is a fact that was conveniently not talked about. Yes, we need to find out what is happening to our bee population. Many think neonics (an insecticide applied to seeds) are suspect in bee death and yet there is research to refute those claims. Neonics has nothing to do with genetically engineered plants although it seems she insinuates it in her article. For a balanced view on the neonics/bees issue, read Save The Bees, But Not With An All-Out Pesticide Ban. The bottom line is we need to keep researching the cause of colony disorder and do what is necessary to protect the bees. There are many questions that arise from this statement. There is no reference to the source of the 90% statement. What specific pesticides is she talking about? Remember the EPA monitors and would not allow soil or waters to be contaminated to a level that is harmful to humans or animals. On a positive note, this is where GE technology shines because it allows farmers to use less pesticides. Good for humans, animals and the environment. This is a common question in regards to Europe’s position on GMO plants. The author has claimed that Europe has banned them and what do they know that we don’t? The fact is many European countries have not banned them, but rather, have not approved them. Big difference. GMO corn is imported and used in livestock all over Europe. Recently, reports are circulating that Europe is having second thoughts about GE technology and may be allowing farmers to grow them soon. This is not a statement in the article, but rather an observation from me. The author is clearly not using her critical analysis of research and it reads more as an advertisement. And it makes me feel very uncomfortable.The dietetics regulatory body forbids promoting anything that is not science-based. In fact, recently there has been some controversy in the field of dietetics because of large corporations wanting to sponsor dietetic conferences. Some claim the sponsorships may affect their integrity. Yes, it is a shame that it takes this much effort to read through and decipher with a critical eye an article that should be an honest and educational read. But, unfortunately, this is a downfall of the Internet. Let’s just say, just because you read it on the Internet, does not make it true! Do your own research! How can you improve your critical thinking skills? Understand and challenge your biases and assumptions – it’s healthy. Biases: When I look at an issue, the first thing I note is where the source originated. Personally, I tend to trust sources from academia and science. And even if it looks like the source is authoritative, I will still investigate to make sure they are a legitimate and credible source. I also ask myself – Is there anything this source has to gain by publishing this information? What is their bias? What is my bias? Do multiple sources say the same thing? Multiple sources add credibility. Don’t be afraid to ask questions, no matter how stupid they may sound. These are just a few of the simple steps I went through as I analyzed this article. Assumptions: All of us make a lot of assumptions about almost everything. It’s how our brain processes certain pieces of information, and how we get along in everyday life. You could say they are the foundation of our critical framework. But what if those assumptions turned out to be wrong, or at least not entirely truthful? Then the whole foundation needs to be rebuilt, from the bottom up. Ask, listen, think . . . Ask, ask and ask some more. Listen. No, really listen. And then think about it. At that point, make a decision. But always remember that you can change your mind as more information is made available. It’s a continuous process. Challenge yourself. Sharpen your critical thinking skills by practicing them often. Testing pollen of single and stacked insect-resistant Bt-maize on in vitro reared honey bee larvae by PubMed. Wanda – I can across this on my Twitter feed this morning and had a chance to read it. What a well done blog. I am a science communicator for a biotech company and you did an awesome job of explaining how to break down articles that you read – no matter what the topic. Really nice work!! Thank you Aimee! I find it’s really challenging to understand these technical issues. Excellent information in this post. Too many people are not willing to find out if there is credible science behind claims. Yes, I agree. And, unfortunately, that gets us in a lot of trouble. I Wanda – thanks for writing this. Glad you noticed some of the same questions I had about this post which seems to be many of the same old anti-gmo myths without much science to support it. Unfortunate to give organics this type of health halo when in fact organic farmers do use pesticides and some of those pesticides can be harmful to bees. The Academy of Nutrition and Dietetics, of which I am a member, has very clear guidelines about ethics. Many dietitians. like me, are also a part of “RDs 4 Disclosure”. While “Dietitians for Professional Integrity” may sound like an admirable goal or group; many dietitians who don’t subscribe to their methods and narrow focus that vilifies Big Ag/Big Food and numerous companies and organizations like Produce For Better Health. Many of us support the work of the Academy of Nutrition and Dietetics and still operate day in and day out with integrity to communicate science based nutrition messages. Leah, Thank you so much for your input. I put a lot of value in what you say and appreciate your knowledge and expertise. Thank you for writing this article. Unfortunately, in the nutrition profession much misinformation gets passed around to other professionals and clients without critical thought. This is just one of many examples. While I do love my profession and my colleagues it is a constant battle to ensure critical thinking and good science-based evidence is used for all subject we are expected to be experts in. Also, I don’t know if you visited the DFPI website. While their overall goals are admirable the tactics and ideology have a lot to be desired. Unfortunately, their views on GMOs are pretty much in line with the dietitian that wrote the article you critique, that is to say little ideology-based rather than science-based. To get a sense of their views check out their proposed sponsorship rubric they want the Academy of Nutrition and Dietetics to follow (http://bit.ly/1oywsaN). Thanks David. I appreciate your feedback. I had another dietician tell me the same thing. I apologize for that. I think of integrity and trustworthiness when I think of dietitians and I was a little concerned the profession was getting derailed and influenced by other companies and/or industries. Please do what you can to keep this profession professional. Wanda, i work in the industry and I thought your blog was one of the best piece written onthe subject. Congratulations. I think it is key that people using GMOs, ie the gorowers, speak about the benefits of the technology and engage with society. It is a lot more power than if the message comes directly from a biotech company. Thank you Phillippe. I appreciate the feedback. Great article on the power of thinking critically about all things science. I am a registered dietitian myself and find it disheartening that a fellow dietitian would write an informative article based in her own bias rather than adequately researched and cited science. In our profession, we are taught to use only evidence-based, proven facts when educating the public, not scare tactics and loosely based statistics. Great post Wanda! So many people take what they see online at face value, often because understanding the science is very hard or time consuming. We need more people out there working to teach people (of all professions) how to be critical of any information they come across. I know how much time it takes to write a blog post like this, so thanks for doing it! Ha, Wanda! I just did a post similar to this explaining basic science concepts all in one spot. That way I have a link to shoot to others who clearly show where they have trouble understanding these concepts. This will definitely go in my bookmarks!!! Great job! Thanks again Wanda. You do a great job speaking up on tough topics but doing it with an eye to creating understanding. Thank you Janice. It means a lot coming from you! I question their very first statement. It is not absolutely clear, but it sounds as if they agreed to become a spokesperson, and THEN decided to ‘educate’ themselves about the issues. It seems that the proper sequence should be to educate one’s self first, then decide whether to endorse a product, before the bias of monetary gain is introduced. The other statement that irks me is the claim that 75% of our food is dependent on bees. The great majority of our staple food crops do not require pollination by bees; crops such as wheat, corn, rice, and soybeans are all self pollinated and do not require bee pollination. This would be more of an issue with some of our fruit and vegetable crops, but not all.